We collect personal information ("pi") including your name, address, telephone number, e-mail address, and credit card information, which you voluntarily provide to order a product or be included on one of our mailing lists; and general information about the number of visitors who come to our site and the material which they review while on the site, and general information that is not personally identifiable such as your zip code, and product preferences. All information provided is strictly voluntary. If you elect not to provide us with your pi you will not be able to place orders at our site and you will not be able to participate in our mailings or promotions. We may store and process your pi and share it with third parties for purposes of fulfilling your orders or to carry out the purposes for which it was submitted. We may, if required by law, be forced to disclose your pi. Except for the foregoing, we will not transfer or otherwise use your pi. If at any time you decide that you no longer want us to maintain your pi, please send us instructions to delete your pi. 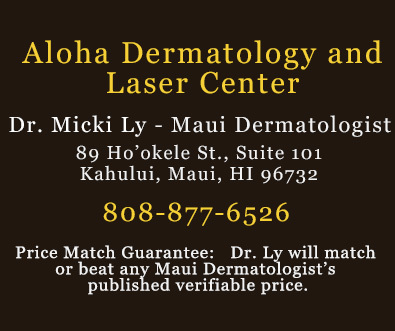 This should be sent to us at dm@aloha-dermatology.com. If you have any questions about security at our Website, please contact us at staff@aloha-dermatology.com. We may also use a technology know as "cookies" or any technology that now exists or is later developed that performs the same general function that track your travel through our site and to help us understand how you and others use the site. Cookies are used by almost every site for these and similar purposes. Most browsers are set to accept cookies. You may reset your browser so that these cookies are not accepted and you may erase reception of cookies. By using this website you signify your acceptance of our Privacy Statement. We reserve the right to change our Privacy Statement at will. We assume no obligation to advise you of any changes to our Policy Statements or our terms and conditions. We suggest that you check back, at regular intervals, for updates to our Privacy Statement.